Shell Beach, Shark Bay, Australia. The beach was named "Shell Beach" because of the great abundance of the shells of the cockle species Fragum erugatum. The seawater in the L'Haridon Bight has a high salinity due to both the geomorphology and local climate of the area. This high salinity has allowed the cockle to proliferate unchecked, since its natural predators have not adapted well to this environment. The shells typically reach a depth of 7 to 10 metres. 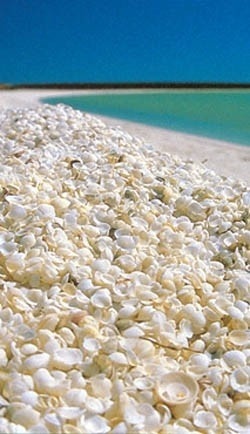 Over time, the shells have formed a limestone that is known as Coquina.